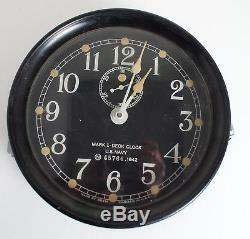 SETH THOMAS PHENOLIC MARK I DECK CLOCK NAVY WWII. This is a Seth J Thomas Mark I deck clock in excellent condition. Its phenolic case and is meant for exterior use on US Navy ships. Its serial number is 45766 and dates to about 1942. It has a 7.5: diameter overall and is 4 deep. The dial diameter is 6. 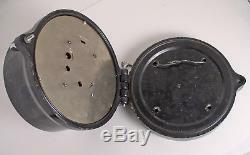 Its a 12-hour clock and its wound from the back as it hinged on a base plate. The dial looks to be in mint condition showing only an age patina. The original military specification stated there would be 2 types of mechanical clocks. Type A 24- hour dial and Type B 12-hour dials in sizes 6 and 8.5 and that the clocks rune for at least 8 days with a 11-jewle lever nonmagnetic escapement. Class B being the phenolic molded case. I did a 24 hour time test and the clock is withing 25-30 seconds to computer time. Further adjustments would be best done once its in a given location and should be able to adjust to a few seconds. 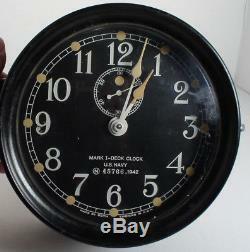 The item "SETH THOMAS PHENOLIC MARK I DECK CLOCK NAVY WWII" is in sale since Friday, March 30, 2018. 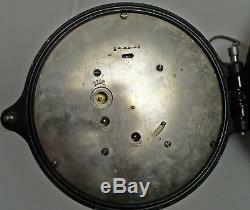 This item is in the category "Antiques\Maritime\Clocks". 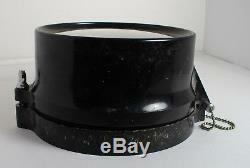 The seller is "fajt40" and is located in Fair Oaks, California. This item can be shipped worldwide.